Many people know from Vietnam as a country of war, with the sad period from 1945 to 1975, more than 30 years of war with France and the United States. But nowadays, Vietnam is a peaceful country with market economy is developing strongly. Come to Vietnam, you will not only travel but also know more about the Cultural, people, beautiful natural landscapes and majestic. You can start your trip from one of the two major cities of Vietnam: Hanoi capital or Ho Chi Minh city. Next you will run along the length of Vietnam, with a lot of cultures and long beaches. North Vietnam (Hanoi, Sapa, Ha Long bay, Ninh Binh): the summer from April to October, the hottest time from 30 – 35 degree Celsius, heavy rainy. December to March: temperatures between 10-15°C. February and March can be damp with drizzle and overcast skies. 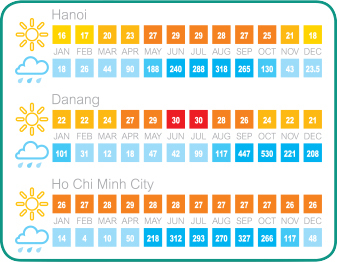 South Vietnam (Ho Chi Minh, Phan Thiet, Phu Quoc): sunshine all year, but weather is almost hot and wet. TET (Vietnamese New Year): generally takes place at the end of January or early February and lasts for three days. Note: TET is really good time for Cultural tours in Vietnam, the time for festivals. Traffic in Vietnam is an experience for you. You will be surprised when the people control the vehicles sped on the road. But when fear and surprise over you will feel everything is ok, but it would still be a crazy traffic. You can use any vehicles for your trips, very easily to find and rent in vietnam. Motorcycles are commonly, most families have 1 or 2. Taxi: we recommend that you should call the Mai Linh taxi company; they have a lot of car in almost big city, good services and always give you the right price. At your hotel, you should ask the hotel reception, or people you know. Do not call a taxi on the road. Train and Airplane: you can book tickets through us or any agents in Vietnam, this is simple. We suggest vietnam airlines company for long distances. And train travel from Hanoi to Sapa. Motorcycle taxi (Xe Om): This is a popular type of service in Vietnam. You can see them at the crossroads in the city, or densely populated areas such as: markets, school. They are professional motorcycle rider, can easily take you anywhere. We are committed to providing the best service for you, but in case some problems can still occur, and insurance is the best way to minimize damage. You can refer to a number of insurance companies: Motorcycle insurance company Carole Nash, or Onlyinsurance. In Vietnam, you should refer to the Bao Viet Insurance company. Explore different cultures is an interesting experience, to integrate and can explore a culture that you should follow some general rules. It was not an obstacle but an interesting thing. In any case you should remain calm and avoid angry, avoid shouting. When in the area of religion: you should wear long pants, cover your shoulders, and take off shoes when entering the house. Do not show affection in this area. Do not sit with your feet pointing towards people. When visiting someone’s house, do not sleep or sit with the soles of your feet pointing towards the family altar. Do not give handkerchiefs, anything black, yellow flowers or chrysanthemums as a gift. Bring fruit, sweets, flowers, fruit, or incense as a gift if invited to a Vietnamese home. Do not sit until shown where to sit. The oldest person sit first. Do not carry large amount of money or wear a lot of jewellery. Never leave your bags unattended. You may become a victim of a pickpocket or drive-by bag snatcher. Do not take video cameras into the ethnic minority villages. They are considered to be too intrusive by the local people. Do not take a photo of somebody without asking for permission. Do not take pictures of anything to do with the military, which is considered a breach of national security. In Vietnam, the popular food in a meal including: rice, meat, vegetables. People often eat with fish sauce. From three main ingredients can make a lot of different dishes, depending on the season and depending on their interests. You will feel overwhelmed by the variety and richness. Some dishes you can not miss it: Pho, Bun cha, Cha ca, Banh Xeo, Bun bo gio heo, Lau Mam.